If you’re familiar with some of the novelty USB gadgets out there like missile launchers and such, you’ve probably seen a Dream Cheeky product. The company has announced a new product called the iStrike Shuttle that is on Kickstarter right now looking for the funding for production. 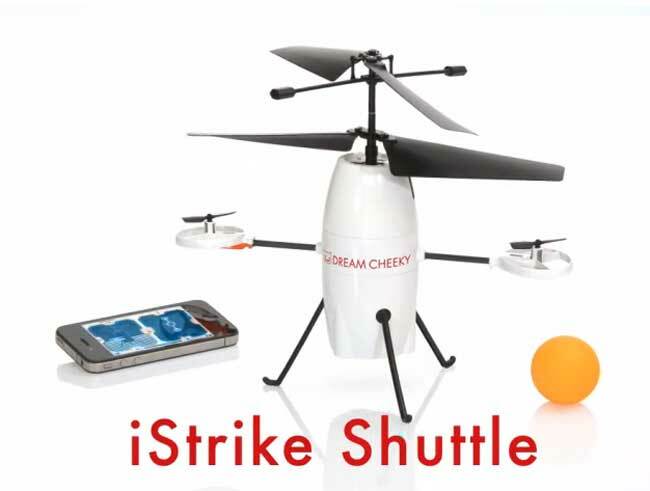 The device is a iOS controlled flying toy. The app will allow control of the helicopter using motion controls or finger swipes. The coolest part about this flying toy is that it has a ping-pong ball inside they can be dropped at the touch of a button. The toy helicopter also ships with a orange wheel that connects to the bottom of the helicopter to help you learn to fly it. The project is seeking $30,000 and has raised $9851 so far. There is still 25 days to fund the project and it will cost you at least $85 to get your own iStrike when and if it launches. Dream Cheeky promises that the device will be delivered in December.